Recently it has been becoming more and more chilly outside, the weather actually dropped down to the thirties over the weekend! It's time to start pulling the cold weather clothes out of storage and by cold weather clothes, I mean coats and jackets. Peacoats are the perfect inbetween jackets, they're first of all, super fashionable, and second of all a great way to keep warm without overheating. The one that I'm wearing is from Tommy Hilfiger and it's a nice heavy material that can keep me warm. Although it was actually quite cold, I went for a skirt, mostly because I found this skirt from Forever 21 for less than six dollars! If that's not a bargain, I don't know what is. 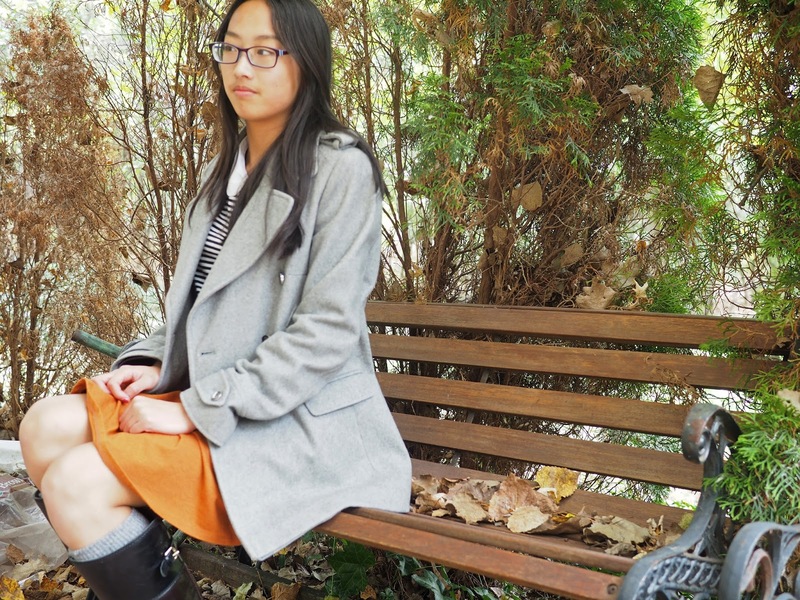 This skirt has the perfect fall tone, this brownish orange color, almost like an amber. I've been trying to wear more and more fall tones besides burgundy and maroon, since I always seem to gravitate towards those colors. This color is super pretty and autumnal and definitely different than the usual shades I wear. Along with the skirt, I paired it with a black and white striped top with a peter pan collar that I got at Topshop. I am obsessed with peter pan collars and this top is super simple in the best way. I can match it with pretty much everything and the collar adds a lovely extra accessory to any outfit. Interested to know about the things I'm wearing?